Giving a home to an English Setter rescue dog can be a very rewarding experience. There are a number of reasons why dogs are placed in a rescue center. From time to time, circumstances change and people are no longer able to look after their dogs. Other times, dogs are placed because they have been lost or abandoned and their owners have not been traced, or sadly, the dogs have been mistreated and taken away from their owners. Rescue centers and organizations play an important part in matching unwanted dogs with new owners. English Setters are gun dogs and are a working breed. There are two types, Bench Setters and Field Setters. Bench Setters are larger and are typically show dogs whereas Field Setters are smaller. 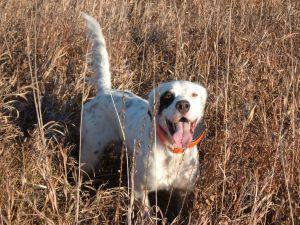 Being gun dogs or 'pointers', English Setters have a tendency to chase birds and game. This means that they can become distracted when walking and can sometimes be difficult to recall. English Setters are also full of energy and require adequate exercise. These can be very positive features of the breed, but can also make them difficult for some people to look after. The combination of the dog's lively nature with perhaps a change in the owner's lifestyle, can result in the need to place the dog in a recue shelter. Sometimes an owner may simply be unaware of the special requirements of an English Setter before forging ahead and bringing one home. Although this is a very sad situation, placing the dog in a rescue center where he will be cared for is preferable to keeping him in unsuitable circumstances. If you are looking for an English Setter, then adopting a dog from a rescue center can be very rewarding. Although some dogs placed in the center are there because of behavior issues, others will be there through no fault of their own. English Setters love to bond with humans and quickly become attached to their new owners. Most rescue centers carefully interview potential owners to ensure that they going to provide a good, steady environment for a rescued English Setter. This can be reassuring for a potential owner as they will often also be advised about the temperament of different dogs looking for homes. This helps ensure a good match. Ensuring that a dog is going to a loving home for the rest of his life is paramount, so a rescue center will want to be sure that the potential owners are well informed about the English Setter breed. The adoption process might include house visits to check that the potential owners have suitable space for a dog. In-home interviews may also be conducted. Most rescue centers will also allow potential owners to take dogs for walks giving both the opportunity to get to know each other. There are a number of dedicated English Setter rescue organizations run by charitable people who are passionate about the breed. Rescue centers often have an education facility and can offer advice about the English Setter breed's special requirements. The websites above all offer detailed information about the process of adopting an English Setter. Help and Support: When settling your new dog into your home, do not be afraid to ask for help or advice from the rescue center. This will be a strange time for both of you, need support! Reassurance: Your new dog will certainly have had an unsettling few weeks or months. Give him lots of reassurance and let him know that you are going to be a partnership for life. Other Animals: English Setters do chase small creatures; it is in their nature and is one of the qualities of the breed. Do consider this and be sure that this won't cause a problem. Adopting any dog can be a challenging experience, however it is immensely rewarding. English Setters make wonderful pets and it is a privilege to be able to give one of these lovely dogs a new home.